This report was developed by the EU Horizon 2020 project AquaSpace to describe a targeted review of tools and methods that can be used for the spatial allocation of aquaculture activities in terms of environmental and economic costs (e.g. risks) and benefits, within the overall Ecosystem Approach to Aquaculture (EAA) frame. The report provides spatial planners with useful information to identify which tools and methods can be more appropriate to support EAA within MSP. Identified tools and methods were reviewed and evaluated based on specific functions and components and through consultation of the stakeholders involved in the AquaSpace case studies. Finally, existing gaps and needs for the development of future EAA supporting tools and methods were identified. What existing tools and methods support EAA within MSP? What criteria can be used to select appropriate tools and methods to support EAA in a planning process? What are the research needs to improve existing tools and methods for EEA? The report “Tools and methods supporting EAA: Finding the gap towards an environmental Cost Benefit Analysis” was developed within the EU Horizon 2020 project AquaSpace. The project aims to provide increased space of high water quality for aquaculture by adopting an Ecosystem Approach to Aquaculture (EAA) to support MSP and to deliver food security and increased employment opportunities through economic growth. EEA was defined by FAO as a strategy for the integration of aquaculture within the wider ecosystem in such a way that it promotes sustainable development, equity, and resilience of interlinked social and ecological systems. This report provides a targeted review of tools and methods that can support the AquaSpace project objectives and that can be used for the spatial allocation of aquaculture activities in terms of environmental and economic costs (e.g. risks) and benefits, within the overall EEA frame. For the identified tools and methods, the report highlights strengths and weaknesses, in order to support the selection of the most appropriate ones that can be applied in a specific planning process supporting EAA. Furthermore, it provides information on aspects which should be further integrated or better designed for the future development of tools and methods supporting EAA in MSP. Information provided by the report used to develop this practice is completed by another AquaSpace deliverable “Synthesis of the lessons learned from the development and testing of innovative tools to support ecosystem-based spatial planning to aquaculture”, which is also available as practice description. References (i.e. complete bibliographic reference). 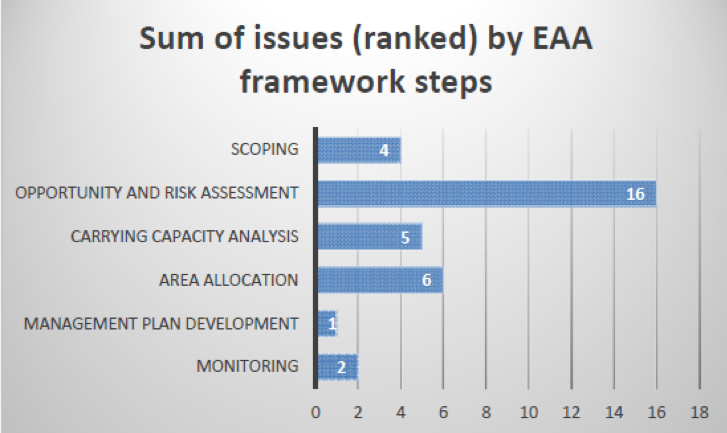 Relevance of tools and methods for the EAA framework steps (scoping, opportunity and risk assessment, carrying capacity analysis, allocation of user/area access, develop of management plans for the area, monitoring of the plan) was assessed. Further evaluation of EAA tools and methods was based on their technical capacity: (i) data requirements, (ii) training and expertise required to run those tools and (iii) costs expected to unfold their entire spectrum of functionality. The aim of this step was to support users choice of selection for the most appropriate case specific tool and method to use. Finally, recommendations, remarks and conclusions were reported. A total of 20 tools and methods, which allow assessing the effects (i.e. 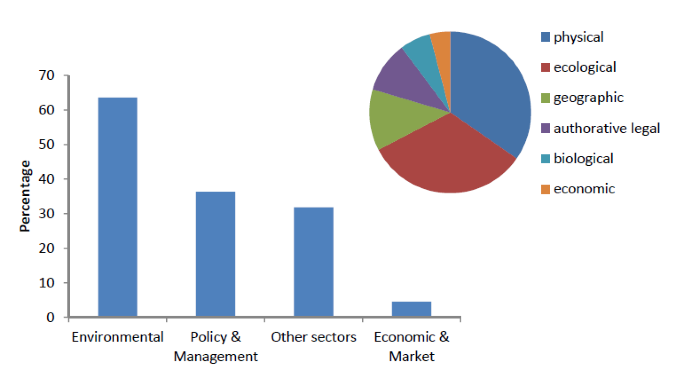 costs and benefits) of a planned aquaculture venture in relation to the overall spatial planning context, were identified, reviewed and analysed. 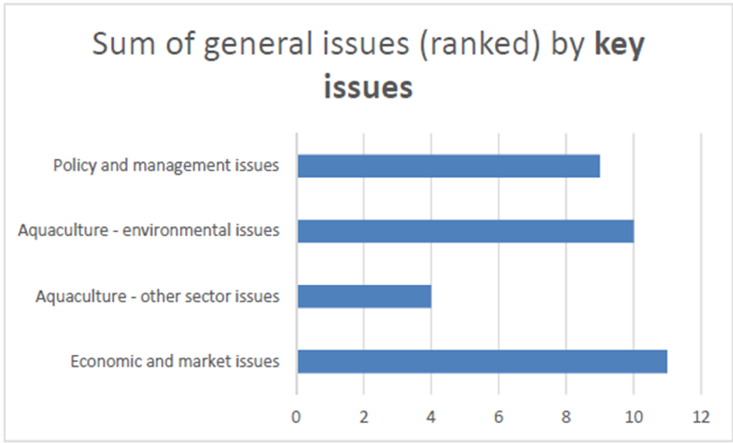 The stakeholder consultation workshops generated a ranking of relevance (according to the stakeholder perception) of the EEA framework steps and key issue categories, as reported in below graphs. In order to identify tools with the potential to support MSP towards EAA, the issues identified during stakeholder workshops were compared with the selection of tools and methods acquired during the review. ‘Seascape’ was potentially recognized as the most suitable tool (performing > 75% of the searched functions related to the EEA framework steps), followed by several other tools and methods performing 50 – 75% of the searched functionality. Although each of the tools reviewed show a wide variation of tool functions, none of them fits all stakeholder demands equally. The results of the technical capacities evaluation for each tool was summarized in a table which represents a useful reference to select the most appropriate tools and methods depending from the scope and needs of a specific planning process involving EEA. A GIS-based tool would be advantageous for holistic assessment of all costs and benefits of planning options in a wider MSP context. Tools and methods developed to support EAA should be promoted to a broad stakeholder community to enable them to select those most appropriate to their application. It would be useful to identify standards for the customisation or development of operational tool(s) for evaluating planning options. It would be useful to also define standards for the use of data related to aquaculture planning and management in EU waters. Future developments of tools should address facilitation of licensing processes. The evaluation of ecosystem services might be one step forward to expand the technical capabilities in evaluating environmental benefits. Nevertheless, although being part of the review, the outcomes of tools and methods in addressing ecosystem services were rare. The methodology used in this report can be used for the evaluation of new tools and methods that will be produced in the future in order to compare them with existing ones and evaluate their reliability to support EAA in MSP. The report also provides good scientific-based approach and information for the selection of existing tools and methods. The report was developed within the Horizon 2020 AquaSpace Project, Horizon 2020 grant no. 633476.